TunnelBear has been on the market since 2011. It offers a simple VPN solution designed to suit the needs of the majority of Internet users. It is easy to set up and use while also packing a bunch of useful features that provide you with an increased level of protection. In this TunnelBear review, we’ll take a look at all the major upsides and downsides of this VPN service. Annual plan only $4.99 /month! Like we said, downloading and installing TunnelBear is easy-peasy. Just click the Download A TunnelBear button on the provider’s website, launch the installer, and the wizard is there to take you through every step of the process. Once the software is installed, you are prompted to create your account. Enter your information, verify the account, and you are good to go. Not long ago, TunnelBear was spurned by critics for its “antiquated” interface. Although we found it to be charming back then as well, in the meantime, the client got a sleek and modern upgrade while remaining refreshingly different from what we are used to seeing in VPN clients. The pleasant color scheme and bear-related animations make for a friendly and comfortable environment. The features are all neatly categorized and mostly come with on/off buttons, contributing to the utter simplicity of use. TunnelBear operates servers in 20 countries worldwide, including all the usual suspects, such as the US, the UK, Hong Kong, and Singapore. While 20 countries isn’t a lot, it is enough to cover most of your needs. Note that the Australian server is available only to paid users. When it comes to the speeds across devices and servers, they are not particularly impressive, but they are not bad enough to prevent you from browsing and streaming without any annoying glitches. Although they are rarely above average, they are not below average either. Performance is rather smooth overall and the very good news is that we detected no DNS leaks during our tests. Paying users get unlimited bandwidth with their subscription, which allows for carefree browsing, streaming, and downloading. TunnelBear offers clients for Windows, Mac, iOS, and Android. Unfortunately, it only offers limited support for Linux users. It is not compatible with routers, gaming systems, Kindle, Blackberry or Smart TV. On the plus side, it does offer extensions for both Opera and Chrome, which is great news for users who only want to encrypt their browser traffic. With a single subscription, you can set up TunnelBear on all of your devices. What is also great is that the software allows as many as 5 simultaneous connections, which is as generous as it is useful. As you could see in the previous section of this TunnelBear review, this VPN provider does not boast great device compatibility. However, it does support major operating systems and allows you to use the software on up to 5 devices at the same time. What may come as a surprise and a disappointment to torrent users, TunnelBear does not allow P2P sharing. This is possibly one of its greatest downsides, as torrenting is one of the main reasons why people use VPN. We have suggested earlier that TunnelBear brings you plenty of useful features. You can configure it so it launches and connects at startup. You can override TCP for improved stability of the connection. You can list your trusted networks and have TunnelBear automatically activate when accessing untrusted or unsecured networks. You can also turn on notifications, such as those related to unsecured network detection, disconnection, disruption, and more. TunnelBear offers two particularly useful features named VigilantBear and GhostBear. VigilantBear is basically a VPN kill switch. Its main function is blocking traffic at times when a VPN connection is not established. 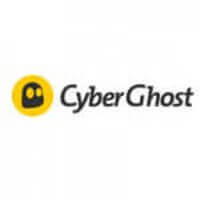 GhostBear can best be described as stealth mode or obfuscator. It makes your VPN connection appear like a regular connection, so it doesn’t get blocked. Recently, TunnelBear also announced their corporate service aimed at business teams. This addition was built on top of the existing platform, so it’ll offer all the same benefits, only elevated to a corporate level. Admins will also be able to monitor the total expense for every member through a dedicated centralized dashboard. All of these handy features are incredibly easy to use. All you need to do is turn them on or off and you do not even have to be familiar with their functions – they all come with clear and simple explanations. Thanks to this wealth of security features and zero DNS leaks, TunnelBear provides you with an extremely high level of security. TunnelBear uses two protocols: OpenVPN and IPSec/IKEv2. Windows, Android, and Mac users get to enjoy the benefits of using OpenVPN with the ultimate AES 256-bit encryption and SHA256 authentication. Users of iOS 9 and later versions get to use IPSec/IKEv2 with AES 256-bit encryption and SHA256 authentication while the users of earlier versions of iOS use IPSec protocol with AES 128-bit encryption and SHA1 authentication. Apart from using the safest protocols and strong encryption, it also prevents trackers from blocking your VPN connection. It is comforting to know that TunnelBear does not keep any logs of your activity. It also allows you to pay with BitCoin, providing you with complete anonymity. While researching for this TunnelBear review, we stopped by the Help section of this VPN provider’s website and honestly found nothing to be missing. All the basic issues are covered and the search field makes it easy to find anything you need. If you find yourself needing help from an expert, you can send your questions to the staff by filling out an online form. Most of the time, you can expect an answer within 24 hours. Unfortunately, TunnelBear does not offer live chat, which is rather disappointing, as it means no quick answers when you need them most. TunnelBear offers 3 different packages: Little, Giant, and Grizzly. The Little plan comes free of charge and brings you 500 MB of bandwidth per month. 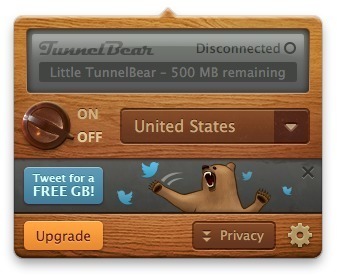 If you tweet about TunnelBear, you get to enjoy 1 extra GB of free bandwidth. 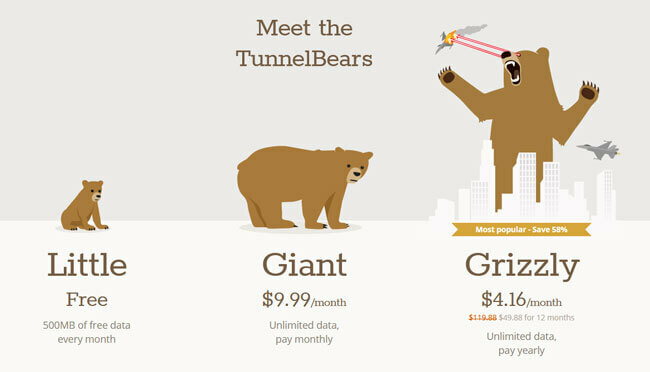 The Giant plan is TunnelBear’s monthly plan that brings you unlimited traffic and comes at the price of $9.99 per month. The Grizzly plan gives you access to all the features included in the Giant plan, but it is billed once a year and costs $4.16 per month. TunnelBear for teams has a price tag of 69$ per year, which is close to the price of the Grizzly Bear plan. As you can see, instead of a free trial, TunnelBear opted for a limited free version of the software for private users. However, note that Tunnelbear for teams comes with a 7-day free trial. As far as payment methods are concerned, you can pay with Visa, American Express or MasterCard. The provider also accepts BitCoin, allowing you to stay absolutely anonymous while purchasing. You can even pay for your subscription with jars of honey, which goes to prove just how eccentric TunnelBear’s founders are. As we wrap up this TunnelBear review, here’s a quick overview of the features that wowed us and the aspects of the service that could use some improvement. Our ratings are the result of an objective and independent evaluation of TunnelBear, generating the final rating that reflects the overall quality of the company. Ratings may change as the service changes. TunnelBear user rating based on 3 user reviews. We found 1 verified TunnelBear discount for April, 2019. Annual plan only $5 /month! Sign up and we’ll let you know about future TunnelBear promo codes. Discover the full range of possibilities TunnelBear offers and become an advanced user in no time with our beginner-friendly TunnelBear guides. Whether you are interested in secure torrenting, unblocking Netflix, setting up TunnelBear on all your devices or you simply want to learn more about TunnelBear, you can find verified information and clear instructions in our TunnelBear guides below.